Introduced string matching algorithm in the background of WaykiTimes, eliminating the duplication problem in the news section. Started user behavior data collection and analysis program. Regular routine: Provide technology support for cooperative exchanges and wallets and maintain WaykiChain nodes. Launched and promoted “WaykiChain Engligh Developer Portal”. Provided support for the developers of WaykiChain web plug-in, and the development is 50% completed. Completed the guiding page of Developer Incentive Program in English Developer Portal, which is written by Markdown. Worked with Overseas Marketing Team for recruiting developer volunteers. Improved the parameter interface and implementation of the offline wallet library go language version (“wicc-wallet-utils-go”), and increased the flexibility to generate various offline transaction data in testing. Completed the automated test for the basic functions of the latest version of WaykiChain public chain, such as token trading, registration and smart contract. Completed the abnormality test of the latest version of the smart contract function library of WaykiChain public chain. Collected the list of JSON-RPC functions that the cooperative exchanges used to call nodes to ensure that the upgrades can be synchronized in time. Successfully built a monitoring & alarm system based on Telegraf+InfluxDB+Grafana to ensure the security and stability of WaykiChain public chain. Developed the first set of fork detection tool of WaykiChain to further enhance security monitoring. To complete the development and debugging of the new wallet interface in WaykiTimes. To optimize the go language version of the offline wallet library (“wicc-wallet-utils-go”) to support the export of android and iOS, and provide corresponding demo program. For the testing samples of the public-chain interfaces, to covert the non-automatic executions into automated executions. To provide monitoring support for public chain upgrades. To cooperate with the developers of WaykiChain web plug-in to complete the first beta version. The user behaviors data collection and analysis project was kicked off. @ version was 84% completed. Analyzed and collected user behaviors. Adjusted the interactive UI to improve the users’ experience. Adjusted and optimized game value setting. Added sound effect of background music. During the Spring Festival Holiday, WaykiChain together with Huoxin, a social platform under Huobi, co-hosted red paper interaction event and attracted 15074 Huoxin users to participate in the event and join WaykiChain community. During the Spring Festival Holiday, WaykiChain official Weibo account hold “Photography Contest Chinese New Year Eve’s Dinner”. There were 157 fans actively partaking this contest. WaykiChain created official accounts in Huoqiu Finance and Gongxiang Finance to convey WaykiChain news to more blockchain partners. WaykiChain Daily News added bounty quiz section. There were 77 participants in last 3 issues. 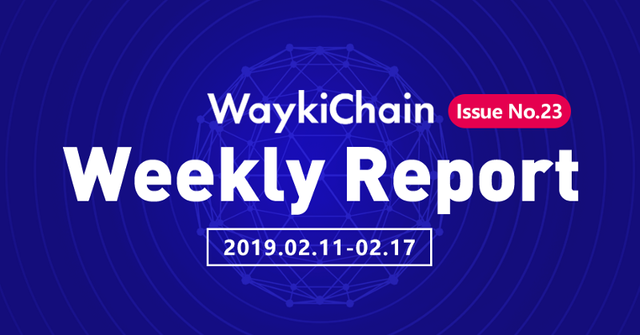 On Valentine’s Day, WaykiChain official Weibo account organized a online discussion- when Valentine’s Day connects to blockchain, and 115 fans partook in the activity. WaykiChain Developer Incentive Program started to receive applications. Developer tasks 1 & 2 were opened to claim. Bounty Invite for WaykiChain Developer Incentive Program was officially launched. There were 54 people made application after developer task 1 &2 were opened in WaykiChain Developer Incentive Program. South Korean bloggers Lilaking and Bluealpha posted threads to express their expect for WaykiChain Developer Incentive Program. There are over 300 American and European media and 23 Korean media, including Reuters, Associated Press, Finanznachrichten(Germany), SBS, Asia Today, Electronic Times, Korea Blockchain News, etc. reporting WaykiChain Developer Portal Launch so far. WaykiChain CEO announced three major strategy via Twitter. WaykiChain CTO released 2019 WaykiChain technology roadmap.